This is the fifth in a series of articles on e-commerce search that draw on findings from our recent search usability report and benchmark. Search scopes are one of the key differences between e-commerce on-site search and general web search. 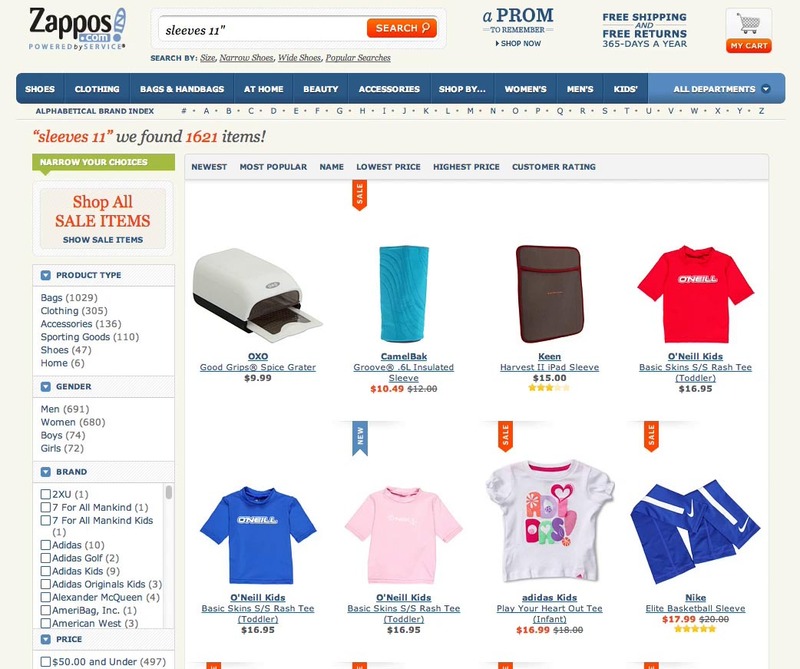 E-commerce sites have their products organized in categories which in turn can be used as “search scopes”. This allows users to limit the boundaries of their search to a specific category. During our large-scale usability study on e-commerce search, allowing users to “search within a category” (i.e. selecting a “search scope”), was found to dramatically increase the quality of the returned search results, and by virtue thereof, improve the users’ success rates. In this article we’ll present these 5 different types of search scope suggestions that can help improve the user’s e-commerce search experience. The best time in the search process to encourage users to specify a scope selection is while they are performing their search. At this juncture, the user has just entered (or is still typing) their search query and therefore hasn’t yet shifted their mindset to that of scanning search results. By including search scope suggestions in the autocomplete results, we can achieve this critical timing, with the scope selection being presented to the user at just the right time in their search flow. Suggesting a search scope in autocomplete suggestions is ideal timing, as this is where users are deciding on what to search for. 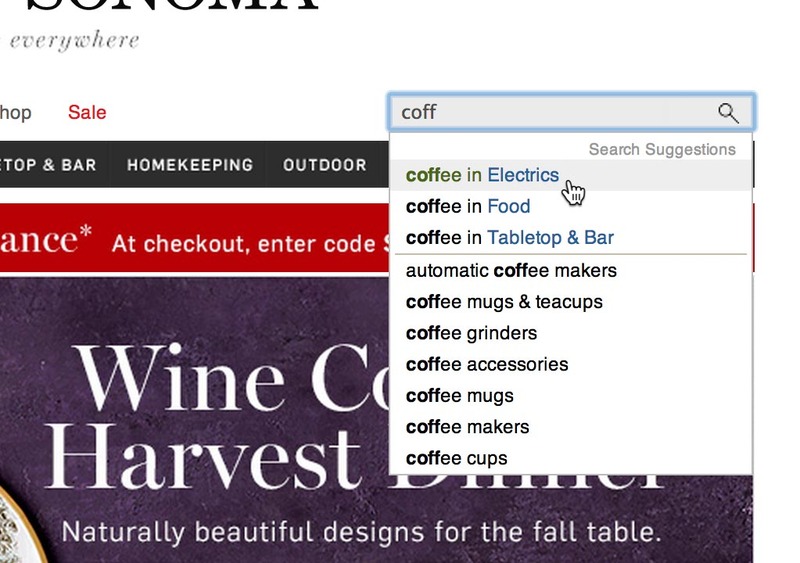 Basically asking “You’ve typed ‘coff’, do you want to search for ‘coffee’ within ‘Electrics’ or within ‘Food’?” Notice how the search scope here at Williams Sonoma are styled in blue, making it instantly obvious to the user that “coffee in Electrics” isn’t a simple query but rather a query for “coffee” within the “Electrics” scope. We’ve previously looked at 8 patterns for how to design a clear and useful autocomplete search suggestion widget. An important aspect of the design of autocomplete suggestions is allowing users to distinguish the suggested search scope from the suggested search query (as illustrated above). Therefore be sure to give search scopes a distinct style in the autocomplete suggestions to make it clear that they are not part of the actual suggested search query. This is typically done by styling the scope in italic, giving it a different color and/or adding indentation. 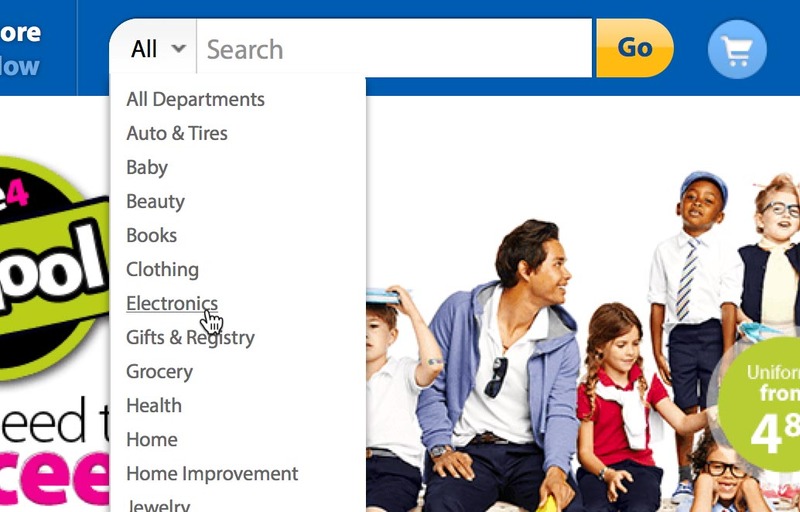 Encouraging users to search “within a category” by manually selecting a search scope – either prior to performing their search or as a modification to a current search – can make sense on large sites with vast and diverse product catalogs. In practice, this will often be the case for mass merchants and multi-store sites, where a search scope is often needed to provide accurate results. However, testing also revealed that poorly designed scope selectors can potentially lead to site abandonments, as users selecting overly narrow search scopes without fully realizing the consequences were unlikely to ever get useful search matches. It’s therefore paramount to have a self-evident design for the manual search scope selector to avoid users misinterpreting the selected scope. 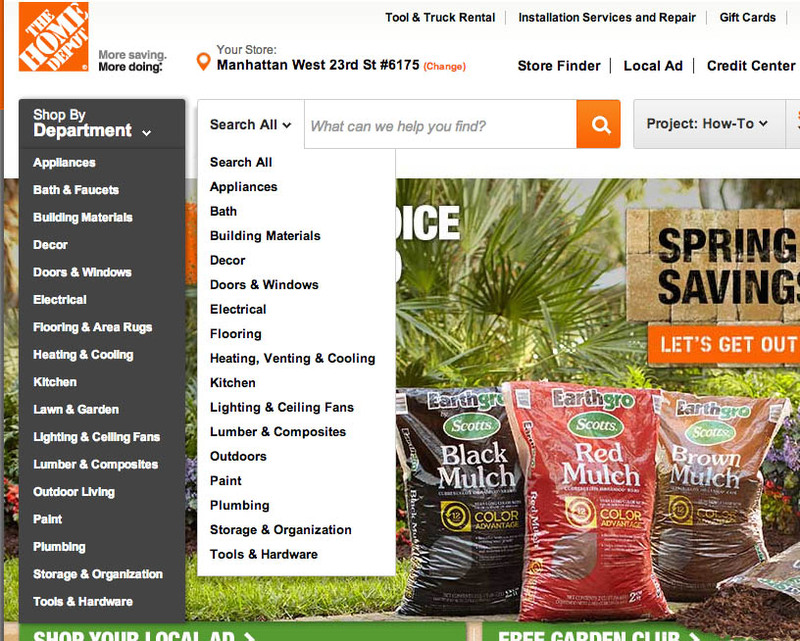 Home Depot offers a manual search scope selector allowing users to narrow their search to a specific top-level category. For sites with vast and diverse product catalogs, there’s an increased risk of search results “pollution” where products in categories irrelevant to the user still match their query and thus end up cluttering the search results unless a search scope is applied. Search scope selector design is kept secondary to the search field design. Selector and search field are in close proximity. A specific scope is never selected as the default value (this lead to multiple site abandonments when testing Tesco). Scope selection is presented using a drop-down (native or custom). Of the 50 top grossing e-commerce sites, it’s only 24% that implement a manual search scope selector. However, if we weed out all those sites where a manual scope selector isn’t strictly necessary, and only focus at the mass merchants and multi-store sites with vast and diverse product catalogs, it’s all of them who implement a manual search scope selector. When users search for products, they frequently query on terms that either directly map or strongly relate to a specific scope or category on the site. Of the 12 query types identified, this will often be the case for Product Type search queries, e.g. “leather sofa” or “laser printer”. Yet, those searches will typically also yield a few products from other categories, which means tools such as category-specific filters and sorting options won’t be available (or they will be mixed from different categories). 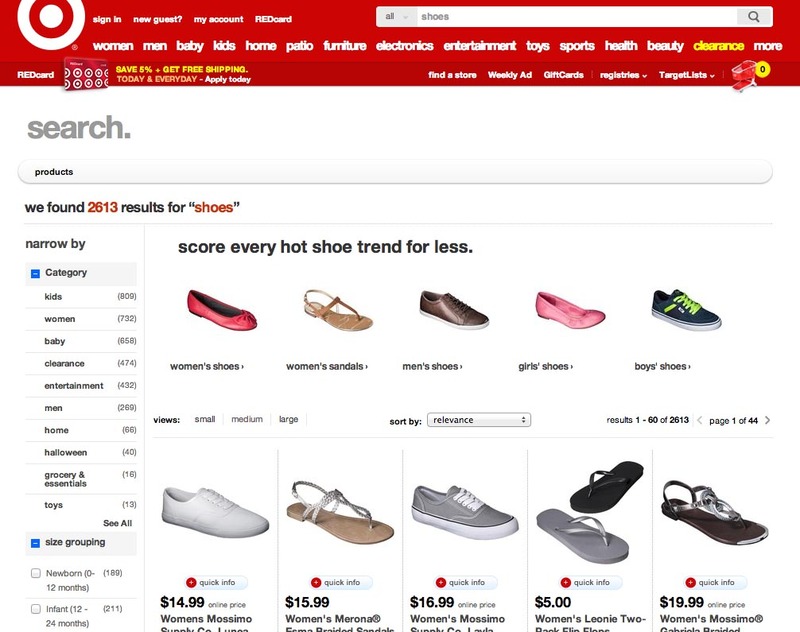 Target suggests near-perfect scopes, here for the generic Product Type search query “shoes”. Note how the user is strongly encouraged to select a search scope by the position and use of thumbnails, compared to if the scopes had simply been yet another set of values in the filtering sidebar. When there’s a “near-perfect” scope, or if there are multiple search scopes which could be relevant, point the user towards these scopes by promoting them on the search results page. This nudges the user towards scopes where they are likely to be more successful, without being intrusive to the user’s search flow and experience. By pointing the user to a better matching search scope, the site is able to display more contextual filtering and sorting options. Furthermore, any scopes the user may have taken for granted (e.g. due to their current frame of mind), can be selected – e.g. a man searching just for “shoes” might actually mean “men’s shoes” (see above example and the Implicit Search query type). With these scope suggestions available the user is encouraged to make such intents explicit. Of the top grossing e-commerce sites, 54% don’t suggest a near-perfect scope nor auto-direct users to perfect scopes. In addition to suggesting near-perfect scopes on the results page, there’s also the case where there’s a “perfect” match between the user’s query and a category. When the match between user query and site category is sufficiently strong, it can make sense to auto-direct the user straight to the category page (bypassing the search results page). This will provide the user with a category page which can be optimized specifically for the type of product it presents (compared to the generic search results layout), offering the user additional category-specific filtering and sorting options. 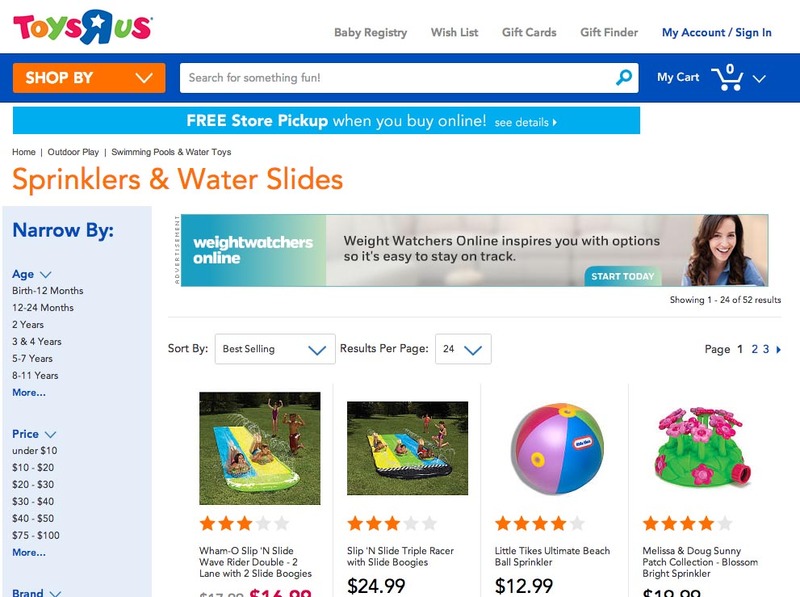 At Toys’R’Us, Product Type queries that match a category will auto-direct the user straight to that page. For example, searching for “water slide” will take the user to the “Sprinklers & Water Slides” category page. The success of the auto-direct will depend on how close the returned category page matches the user’s search query. During testing the subjects clearly expected to see results highly relevant to their query, and we therefore recommend limiting auto-directs to “perfect” matches, and mainly use it for generic Product Type queries that match the high-level product categories (e.g. “womens shoes” or “LED tv”) where “relevant matches” can be better achieved by a curated page. Also, the auto-direct should only occur if the category pages actually offers additional value to the user. This can be anything from improved sub-categorization, help content, guides, additional filters (in particular category-specific ones), optimized layout, etc. Finally, as with most interpreted and automatic actions a site performs on the user’s behalf, the user should always be offered an option to revert to the “normal” results. 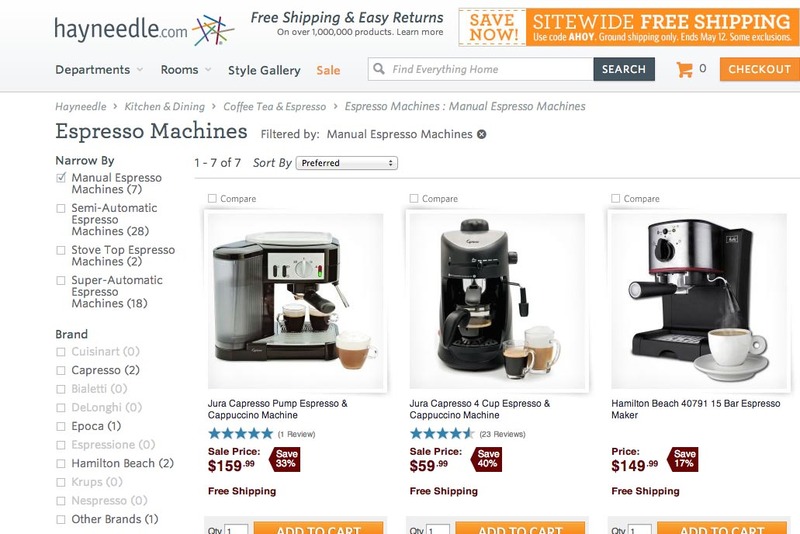 Hayneedle’s search logic auto-directs users searching for “manual espresso machines” to the “espresso machines” category/scope with the “manual espresso machines” filter enabled. This approach is more transparent and allows the user to easily revert the site auto-direction by de-selecting the filter. Suggesting near-perfect scopes (#3) and auto-directing to perfect scopes (#4) complement each other – in some cases suggestions are appropriate, while other times auto-direction is preferred. This strongly resembles the way Google and other web search engines handle misspellings. When there’s a very high likelihood that the user has misspelled a word, Google will automatically correct it on their behalf (but always with an option to “fall back” on the original query). For less clear-cut misspellings, Google will suggests the alternative (i.e. “Did you mean [xyz]?”). In essence, when confidence in the correction is sufficiently high, auto-apply the change (i.e. auto-direct to the scope, #4) with a way to revert to the traditional site behavior; when less certain in the correction, suggest the changes instead (#3). It’s quite natural for users to want to sort their site-wide searches to see, for example, the “highest rated” or the “cheapest” results related to their query. Yet, when the test subjects tried this during testing, it almost always resulted in completely irrelevant products being presented to them unless a scope had been applied first. “Then I get all that stuff. This is annoying. Haha. I don’t need any swim trunks or … That doesn’t have anything to do with a [laptop] sleeve,” a test subject said after sorting his search for “sleeves 11” by price, in hopes of seeing the cheapest 11-inch laptop sleeves available. Instead, a collection of irrelevant products ended up at the top of the results list because they were technically the cheapest items and happened to match something – anything – related to the subject’s query. Users simply don’t consider whether they are in a scope appropriate for sorting or not. And why would they? They’ve just made a clear search query (e.g., “sleeve 11”) and received a list of perfectly relevant results – now all they want is to see the highest-rated items of those results and therefore naturally decide to use the “Sort by” feature the site has placed right there in the search interface. When in this frame of mind, having provided such clear intent and now viewing an initial set of highly relevant results results, few users will think that sorting the results by “Price” or “Ratings”, etc. will yield a list where the majority of products are completely off. It’s only when a search scope is selected that sorting methods based on other factors than relevance will make sense, as the search scope ensures that mainly relevant matches are returned (making all results “high quality”). A dilemma thus arise: sorting parameters such as highest rated and price therefore mostly make sense once a search scope is selected, yet users won’t stop to think of this before sorting by these parameters. Suggesting search scopes within the sorting widget solves this quandary. For site-wide searches Amazon removes the sorting drop-down entirely and instead asks their users to “Choose a Department to enable sorting”. 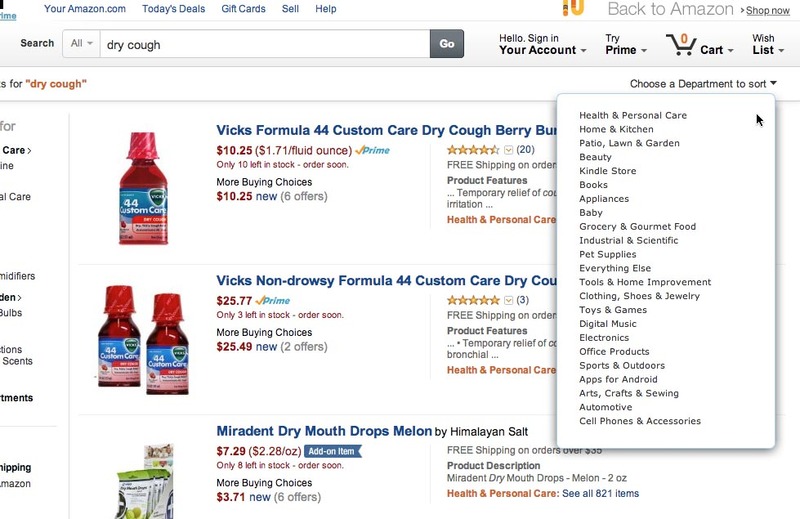 This allowed Amazon to avoid site-wide sorting issues during testing. By promoting a scope selection within the sorting widget, users are pointed towards a useful page instead of being lured in by the promise of a sorting method that ultimately won’t deliver what they are looking for. It allows users to pursue their natural search flow where they attempt to apply a new sorting parameter to their search results, yet then asks them to select a search scope once they actually attempt to do so, ensuring that the user ultimately end up with the results they wanted. It’s important to note that simply disabling sorting of site-wide search results and placing a text instruction to “Select a category to enable sorting” is unlikely to be understood by users – during testing a very large part of the subjects did not distinguish between filtering and sorting (often referring to both filtering and sorting as “sorting”) – and the suggested scopes should therefore be presented within the sorting widget, or in its place. From the test sessions, it’s clear that applying a search scope is not a natural part of most users’ thought process. Rather, users are thinking of the type of product they want and trying to come up with search queries and terms that may prove well-suited for producing such results. For example, if a user is looking for the latest movie with James Franco, few would stop and first select a “Movies” search scope to filter out books by and about the artist – it’s only when users are reminded that there are many other product types related to Mr. Franco that they’d move to apply a suitable search scope. Autocomplete Scope Suggestions (#1) are ideal because they present the scope suggestion at just the right time in the user’s search flow, encouraging the user to proactively apply a search scope. Manual Search Scope Selectors (#2) can be applied proactively too but it’s on the user to remember to do so and our testing shows that users mostly use manual search scope selectors retroactively (i.e. once they’ve received a set of irrelevant search results after applying a different sorting method to a site-wide search). Suggesting near-perfect scopes (#3), auto-directing to perfect scopes (#4) and suggesting scopes within the sorting widget (#5) are all retroactive in nature, aiming to help the user “correct” or improve their search. This is great for users who missed the autocomplete scope suggestions or weren’t prepared to make the selection up-front. Given the numerous different stages a user may go through in their search flow and that most users don’t consider search scopes until they are presented with them, it’s important to utilize a combination of these 5 types of search scope suggestions. Authored by Christian Holst. Published on August 13, 2014.